To your right it is the former Merritt Educational Center which operated from 1943 to 2008. However, if you were standing here in the 1920s or '30s, in its place you would have seen exuberant crowds of fashionably dressed African Americans enjoying Suburban Gardens Amusement Park. 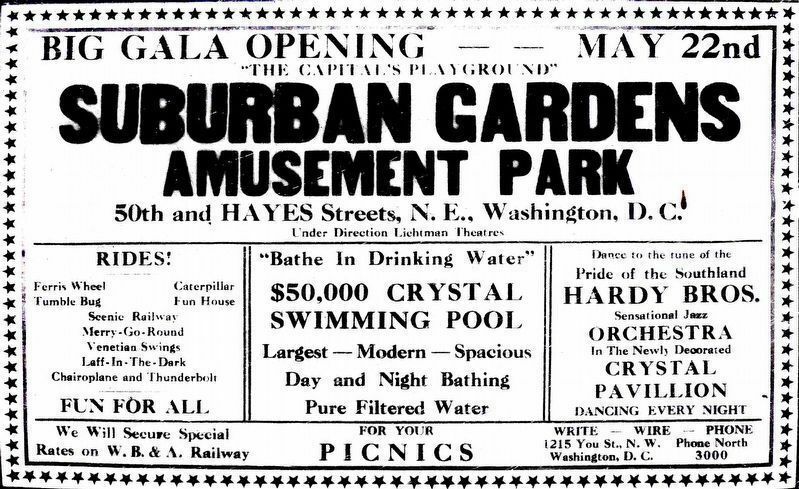 The park was built in 1921 by architectural engineer Howard D. Woodson, writer John H. Paynter, theater magnate Sherman H. Dudley, and other investors of the black-owned Universal Development and Company. 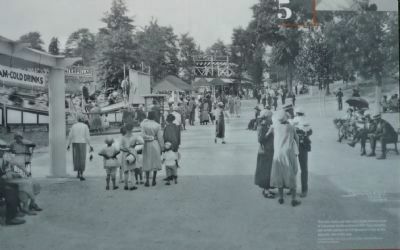 It was the first and only amusement park within the District boundaries. 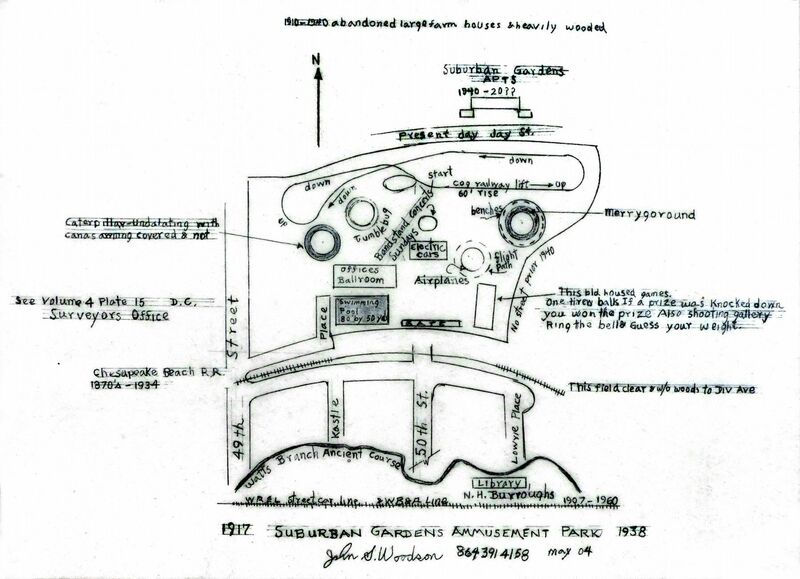 Suburban Gardens park provided seven acres of recreational haven for the region's African Americans, who due to racial segregation, were barred from white-owned amusement parks such as Maryland's Glen Echo. Suburban Gardens Amusement Park, ca. 1935.
and children's playground. The park's large dance pavilion presented both lesser-known musicians and well-known jazz artists such as Cab Calloway and Duke Ellington. After entertaining African Americans for nearly two decades, the park closed its gates for good in 1940. The U.S. government built temporary barracks for soldiers here in 1943. Soon after the building served as Emma F. G. Merritt Elementary School, honoring the educator, civic leader and former president of the local NAACP chapter. The current school building went up in 1976. Location. Marker has been reported missing. It was located near 38° 53.978′ N, 76° 55.895′ W. Marker was in Deanwood, District of Columbia, in Washington. Marker was on 49th Street Northeast south of Hayes Street Northeast, on the right when traveling north. Touch for map. Marker is one block north of Nannie Helen Burroughs Avenue - and about half a mile east of Minnesota Ave, NE, and the Anacostia Freeway (DC Hwy 295). Marker was in this post office area: Washington DC 20019, United States of America. Touch for directions. (about 500 feet away); From Gardens to Garden Apartments (about 600 feet away); National Training School for Women and Girls/ Nannie Helen Burroughs (about 800 feet away); Butterflies (approx. ¼ mile away); With These Hands (approx. ¼ mile away); A Day at the Picture Show (was approx. 0.3 miles away but has been reported missing. ); Shopping on Sheriff (approx. 0.3 miles away). 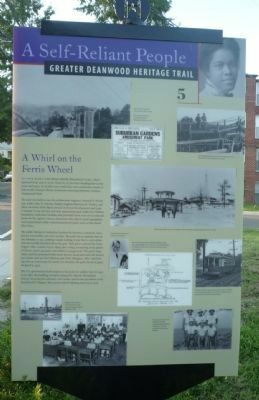 Touch for a list and map of all markers in Deanwood. Related marker. Click here for another marker that is related to this marker. 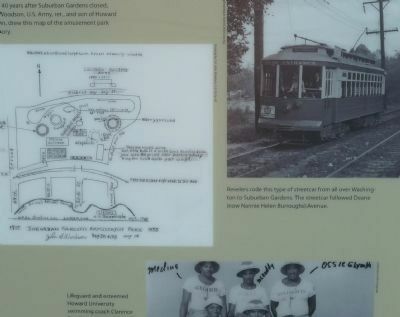 Glen Echo Park remained segregated until 1961, after the arrest of Howard University students staging a merry-go-round sit-in in June 1960 prompted extensive demonstrations by multiracial activists. 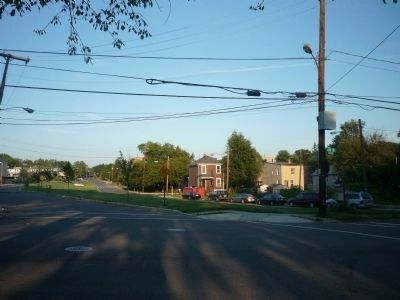 This view is east toward the former site of Suburban Gardens Park - the marker is visible in the shadows, far right. This advertisement ran in the black-owned Washington Tribune in 1921. An off-season view of Suburban Gardens Amusement Park, ca. 1925. More. Search the internet for A Whirl on the Ferris Wheel. Credits. This page was last revised on March 18, 2019. This page originally submitted on November 6, 2009, by Richard E. Miller of Oxon Hill, Maryland. This page has been viewed 1,932 times since then and 12 times this year. Last updated on March 7, 2019, by Devry Becker Jones of Washington, District of Columbia. Photos: 1. submitted on November 6, 2009, by Richard E. Miller of Oxon Hill, Maryland. 2, 3, 4. submitted on November 7, 2009, by Richard E. Miller of Oxon Hill, Maryland. 5, 6, 7. submitted on June 7, 2017, by Allen C. Browne of Silver Spring, Maryland. • Bill Pfingsten was the editor who published this page.